American campers love national parks, which are among the most popular destinations to do outdoor activities and adventures. These national parks also do provide campers like you with spectacular and amazing camping locations. In fact, each national park in the US offers scenic views of nature, as well as a rugged yet natural environment. The open spaces, the diverse climates, and the incredible wildlife have made several locations in the US hotspots, especially for people who enjoy spending some time off the grid and being one with nature. The US offers dozens of beautiful national parks to pitch your tent and let us say this, it is a huge list. Lucky for you, we have tracked down and rounded up the ten best national parks for camping in the US. In this post, we will be discussing everything you need to know about these campsites, as well as a description of the best activities to do while you are there. We hope that after you have read this post, you will be eager to visit these camping sites and appreciate what these national parks have to offer. Keep reading if you want to know more. The Yellowstone National Park is America’s very first national park and might just be the most famous one. In fact, this national park receives an incredible 4 million visitors annually. It was established in 1872 and its location spans these three states: Montana, Wyoming, and Idaho. 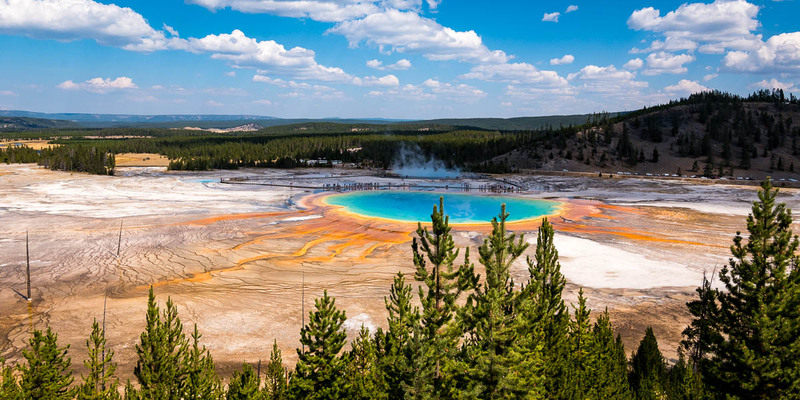 People from all over the world visit the Yellowstone National Park to experience the spectacular geothermal activity that shaped the national park’s landscapes into something extraordinary. Interestingly, some say that it is basically just a giant pressure cooker. Experts also forecasted that once the volcano that sits on top of Yellowstone erupts, it would likely be one of the most devastating natural disasters in the history of the US. There could be a variety of outdoor activities to do while at the Yellowstone National Park. You will be able to see the bubbly sulfuric hot pools and the Old Faithful geyser. You can also trek along the Grand Canyon of Yellowstone, as well as take a dip in the lake. In case you did not know, this national park is home to several large mammal species, which includes the American buffalo, bison, wolves, and grizzly bears, while being among the most legendary of creatures, are also very dangerous. You may opt to explore this very beautiful national park by foot, which is also your way to escape the massive crowd and the flashing cameras. You might want to consider setting up camp anytime but the summer. There is a total of 12 campgrounds in this national park, which consists of more than 2,000 campsites. Park visitors particularly loved fishing, camping, and hiking in Yellowstone. When you are in the northeastern corner of the United States, then you might want to consider camping at the Acadia National Park. This national park is located on Mount Desert Island, Maine and is considered as the Pine Tree state’s natural gem. Not only does it boast its 17 million acres of forest, around 6,000 ponds and lakes, and more than 32,000 miles of streams and rivers to serve as the backdrop for your camping and hiking activities, it is also blessed with a wild and rugged coastline, along with a view of lighthouses and high mountains, making it one of the most visited national parks in the US every year. This national park is also an ideal spot for hiking, as it is home to more than a hundred miles of hiking trails that will lead you through forests, marshland, coastal stretches, and mountains. One thing to remember though is that you need to keep an eye out for moose. They could be very aggressive, especially during the mating season. You may opt to visit the Acadia National Park during summer, spring, and fall. And when you do, you will be able to enjoy the experience, as well as the scenic view of the Cadillac mountain, sand beach, the Jordan Pond Shore trail, the lighthouses, the Schoodic Peninsula, the Thunder Hole cave, the Isle au Haut, the Sieur du Monts, and the Precipice Trail. Lastly, this national park has three campgrounds where you can set up your tent: Seawall, Blackwoods, and Schoodic Woods. The Yosemite National Park in California is very popular because of its waterfalls and granite walls. In fact, the Yosemite Falls is considered the biggest waterfalls in North America alone, with its three drops that total to around 2,425 feet. This waterfall is also the seventh highest around the world. As a camper, you would be interested to consider visiting Yosemite, as this national park spans 1,200 square miles of nature in the Sierra Nevada. The Yosemite Valley has incredible wildflowers and meadows too, not to mention the El Capitan, which is the popular granite wall that arises from the valley and is a very famous rock climbing destination in the United States. In addition, the Half Dome in the Yosemite Valley is another popular hiking and climbing destination. The Yosemite National Park has 13 campgrounds, 10 of which can accommodate RVs and 4 of them are open every day of the year. To add, horse sites and group campsites are available too. If you love hiking, you surely will enjoy experiencing its 800 miles of hiking trails, as well as 282 miles of road. Indeed, every person who loves nature should try visiting the Yosemite National Park at least once in their lives. The Great Smoky Mountains National Park is a diverse national park in the North America region, which has also been designated by the United Nations as an International Biosphere Reserve due to its amazing and unique natural resources. The national park has more than 800 square miles in its territory and is divided between the states of North Carolina and Tennessee. It is also very popular around the world because of its animal life and biological diversity. With over 17,000 species documented in this national park, experts have also estimated that there could be an additional 30,000 up to 80,000 species that may inhabit there. This national park is also an American favorite and one of the most visited national parks. It is also home to the oldest mountains, which were formed around 200 to 300 million years ago. In addition, it is the unique habitat to over 1,500 bears, as well as 100 species of native trees. Camping enthusiasts also would love trekking in the Great Smoky Mountains National Park because of its more than 800 miles of hiking trails. The park maintains at least 10 campgrounds, where you can find dump stations at Cosby, Cades Cove, Look Rock, Smokemount, and Deep Creek campgrounds. In fact, it attracts hordes of visitors seeking for holiday camping every year. In case you did not know, this region is also rich in cultural heritage. It was once a very important place for human settlement, which served as home for Native Americans, as well as the early Anglo settlers. The best time to visit the Great Smoky Mountains National Park is during the summer, fall, and spring. The Denali National Park is one of Alaska’s most visited national parks. The national park is a 6-million-acre home to high mountain peaks, pristine rivers, as well as long valleys and grizzly bears. 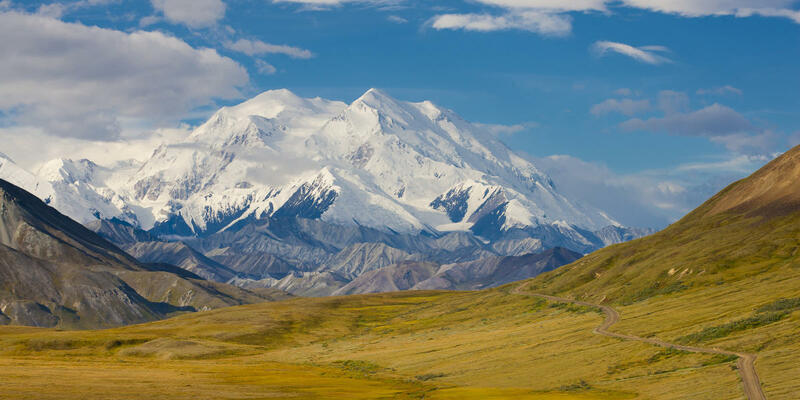 Camping at the Denali National Park will take you to the next level, with its dramatic and scenic landscapes and its endless in-depth exploration. If you are someone who loves outdoor sports and adventures, then this national park would keep you very busy. As the state is America’s frontier, you would experience a sense of solitude and remoteness, which you will never get to experience in the mainland. If you are planning on doing multi-day backpacking activities or river trips, you need to make sure that you come prepared. You would be able to find popular trails, where you may encounter hikers of the same interest during the summer. With its size, it is safe to assume that there are millions of acres that remain uninhabited and untamed. You could visit the Denali National Park all year round. You can also enjoy doing snow sports during the winter. Some of its attractions include the Save River Loop trail, the Primrose Ridge trail, Mount Mckinley, Triple Lakes, the Upper Teklanika or Sanctuary River, the Mount Healy hike, and the Sugarloaf Mountain. Lastly, you can choose from the six campgrounds, which consists of a combined 291 campsites. The Glacier National Park in Montana is certainly every camper’s paradise, as it is very popular because of its natural beauty, where you can enjoy several outdoor activities including camping, sightseeing, among other adventures. It is home to its notable glacier-carved terrain, which is why it was named the “Shining Mountains” and “Backbone of the World”. This national park has over 700 miles of trail that is led by hikers through its immaculate wilderness, rugged mountains, and alpine meadows and lakes. In addition, the Glacier National Park has preserved more than a million acres of peaks, glacier-carved valleys, as well as forests. It is also inhabited by at least 270 species of birds and 70 species of mammals. If you both love hiking and photography, then you should include this national park in your bucket list. Campers are in love with it because it reflects old America: untamed, beautiful, isolated, and wild. The best time to visit Glacier National Park is during the summer, early fall, and mid-spring. Lastly, this national park offers a total of 13 campgrounds, including over 1,000 campsites. It should be noted, however, that while pets are permitted in the campgrounds, they are not permitted on any park trails. The Grand Canyon National Park in Arizona covers around 1.2 million acres and is situated on the Colorado Plateau. It is a world heritage site and it is one of the most studied geologic landscapes around the world. The Grand Canyon is eroded by the Colorado River, which averages 4,000 feet deep. In fact, the canyon is approximately 6,000 feet deep and measures about 15 miles across its width. However, the Grand Canyon is not limited to geologic marvel. In case you did not know, it is also home to more than 1,500 plant species, 89 mammal species, 9 amphibian species, 355 bird species, and 47 reptile species, among others. The traditional Grand Canyon National Park experience is to actually descend into the canyon. You will be hiking through mind-blowing vistas, as well as isolated wilderness areas, which are all just a part of the whole national park. If you are also seeking impressive desert landscapes, the Grand Canyon is always on top of the list. You should keep in mind that the Grand Canyon National Park has two entrances, the south rim, and the north rim. They are hours apart from each other, as you need to drive around the Grand Canyon. The best time to visit this national park is during the fall, spring, or winter. If you are looking to reserve campgrounds, you may either register at the Mather Campground on the south rim or the Grand Canyon Village on the north rim. 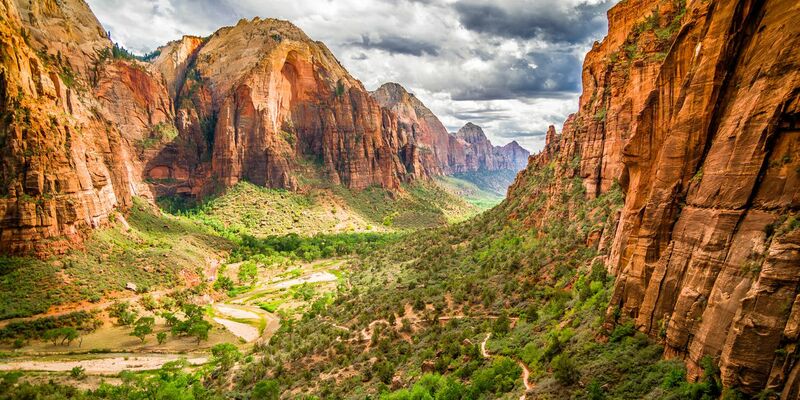 The Zion National Park in Utah features a very distinct desert landscape that has several steep red-walled canyons, emerald pools, magnificent rock formations, rivers, waterfalls, and slot canyons. If you are on a national park road trip, you might want to drive on the road going through the center of the Zion National Park to enjoy the scenic view. By foot, on the other hand, you can hike the trail Native Americans have used for countless generations. In fact, these trails weave through beautiful slot canyons, incredible landscapes, as well as hidden swimming pools. This alone makes this national park one of the most visited in the US, with more than 3 million visitors a year. The Zion National Park is also rich in cultural history and biological diversity. There could be lifetimes worth of hiking and trekking, as well as exploring to be done in this national park. The best time to visit this national park is during the fall and spring. Indeed, its trademark rosy-amber canyons and campground make it one of America’s best national parks for camping. The magnificent Bryce National Park in Utah is just a sight to behold. This national park is very popular because of its orange-red hoodoo rock formations, paired with its outlying pine forest. In case you are not familiar, hoodoo rock formations are pillar-shaped rock formations protruding out of the canyon floor. This artistic touch of nature certainly makes the Bryce Canyon National Park one of the most magical landscapes in the United States. The Bryce Canyon National Park is full of microclimates, in which wildlife lovers can enjoy the scenery with more than 100 species of birds, over 1,000 plant species, and dozens of mammals and reptiles. To add, you would find it to be a very surreal experience when you get to watch the sunrise cast its shade over the canyon’s walls. The best time to visit is during the fall, summer, and spring. Lastly, campers would love exploring this national park by foot, as it is full of hidden geological gems. Last and certainly not the least is the Utah-based Canyonlands National Park, made more popular by James Franco’s self-amputation in the film 127 Hours. This national park should definitely be one of your dream camping destinations. But don’t you worry, you will still have a complete set of arms by the end of the trip. 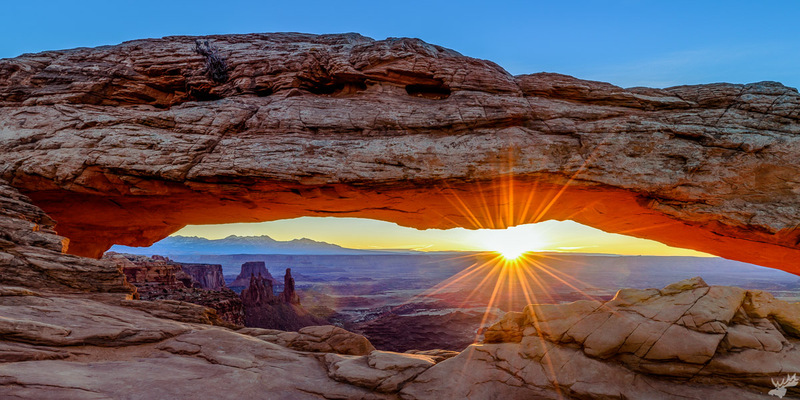 The Canyonlands National Park is an extraordinary marvel of the power of erosion. It features dramatic desert landscapes that will take over all your senses once you step foot in the national park. You would also find it interesting that there are Native American rock paintings that will take you back to the past. To add, there are also towering pinnacles of sandstone protruded into the endless desert sky. The best time to visit this national park is during the spring, summer, and fall. Now that you have read about the 10 best national parks for camping, you now have an idea just how diverse and beautiful national parks in the US are. This goes without saying but the more time you spend to explore these national parks, the more you would appreciate the beauty of mother nature. It would never be enough to just read about them or look at their pictures online. The best way to appreciate these scenic and beautiful landscapes is to experience it through your own eyes. Hopefully, you will have a great time camping at these national parks with your friends and family.